Non-alcoholic fatty liver disease: what is the role of primary care? the key role of primary care in screening and identification of those at risk, as well as providing education and preventive advice. The pathogenesis of fatty liver disease remains incompletely understood. It is probably part of a more complex systemic disease process that is associated with increased calorie intake and reduced energy expenditure. There is a particularly strong association between NAFLD and insulin resistance; in fact virtually all patients with NASH are insulin resistant.8 The strength of this association is greatest in those with central (visceral) obesity and other features of the metabolic syndrome, particularly type 2 diabetes.9 The hyperinsulinaemia found in patients with NAFLD and metabolic syndrome is the result of greater insulin secretion by the body in an attempt to maintain normal glucose and lipid homeostasis. Why is it important to recognise and treat NAFLD? Again, comorbid conditions such as diabetes, greater central adiposity, and more advanced liver disease (such as higher grades of liver inflammation and fibrosis) predict worse long-term outcomes. There are currently no definitive diagnostic tests for NAFLD. When suspected, other important causes of chronic liver disease should first be excluded, including viral hepatitis (HBV and HCV), significant alcohol intake, medications, autoimmune hepatitis, Wilson's disease, and haemochromatosis. A personal or family history of obesity, diabetes, hypertension, and dyslipidaemia are also further clues to the presence of NAFLD/NASH. Controlled attenuation parameter (CAP) is a technique that measures the attenuation of an ultrasound wave propagated through the liver using a transient elastography probe. Transient elastography was designed to measure liver stiffness, which in turn correlates with fibrosis. Controlled attenuation parameter has now demonstrated good accuracy in the detection and grading of steatosis when compared with liver biopsy.17 Unfortunately, it can often be technically difficult to obtain accurate information using these tools in overweight and obese patients. The current gold standard for the diagnosis and staging of NAFLD remains a liver biopsy. This is not ideal given its invasiveness and the risk of serious complications (1–3%),21 along with the fact that only a small segment of liver is of course taken at biopsy, making it subject to sampling errors. There is no single treatment for NAFLD/NASH. 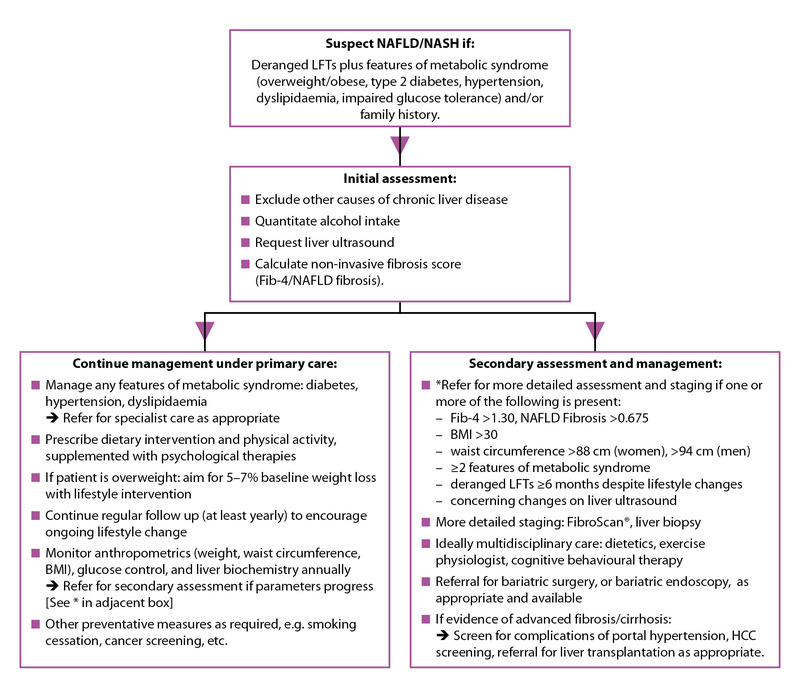 While several potential therapeutic options are under development, lifestyle interventions remain the most effective treatment modality, especially given the maladaptive behaviours that often underlie the development of the metabolic syndrome and NAFLD (see Figure 1, below). Lifestyle interventions typically involve dietary modifications and physical activity changes, and should also incorporate cognitive behavioural therapy wherever possible. It is important to remember that while weight loss in the overweight and obese is ideal, there is growing recognition of the many far-reaching benefits of lifestyle changes that can be achieved, independent of weight change. The macronutrient composition of the diet may also be important. Findings from available studies to date suggest there are benefits from a diet that is low in saturated fatty acids and carbohydrates, and high in monounsaturated fatty acids and dietary fibre.26,27 A Mediterranean style diet, which incorporates many of these factors, would appear to confer the most benefit, especially given its association with reduced rates of CVD and malignancy, and improved overall mortality.28,29 In NAFLD, such a diet was found to significantly reduce insulin resistance and serum lipids—including liver function tests after just 6 weeks—independent of any weight change.30 However, as evidence in this area is still continuing to evolve, no definitive recommendations can be made at this time. Both aerobic and resistance training are of benefit. More moderate to vigorous levels of physical activity (versus lesser degrees of activity), and combined aerobic and resistance training may provide the best outcomes. Resistance training may be preferred by some patients with limited ability to undertake vigorous cardiovascular exercises, and/or those with musculoskeletal ailments. Furthermore, with an ageing population, there is also an increasingly recognised risk of 'sarcopaenic obesity'.34 This refers to the presence of low muscle mass in overweight individuals—thought to be the effect of declining muscle mass concurrent with increasing body weight/fat due to decreasing basal metabolic rates with age. It has been reported in up to 12% of older individuals,35 and highlights the need for caution when making physical activity recommendations, especially as aerobic training alone, when combined with calorie restriction, may cause further loss of muscle mass and functional decline among elderly patients. While there are no broadly accepted physical activity guidelines for the management of NAFLD, the European Association for the Study of the Liver (EASL) recommends at least 150 minutes per week of moderate-intensity physical activity (such as brisk walking), and at least 75 minutes per week of vigorous-intensity physical activity (such as jogging), in addition to muscle strengthening activities at least twice a week.25 Ideally, any exercise prescription should be individualised, and delivered by a trained exercise physiologist. Vitamin E is a micronutrient with potent anti-oxidant properties. It is now recommended as first-line drug therapy for those with proven NASH,38 while pioglitazone can also be considered. Given the limited evidence with these agents among patients with diabetes and cirrhosis, however, these treatments cannot currently be recommended among these individuals. Also, further caution has been recommended with the longterm use of vitamin E in view of some reports suggesting a possible link with increased mortality. There is no evidence supporting the use of metformin or ursodeoxycholic acid for the primary purpose of NAFLD/NASH management. Weight loss surgeries (i.e. gastric bypass, sleeve gastrectomy, and gastric banding) have been shown to improve hepatosteatosis, inflammatory changes, and fibrosis in NASH patients, and are currently the only treatments that offer significant, durable weight loss over the longer term. Not all patients, however, are suitable or eligible for bariatric surgery, especially given the higher risk of anaesthesia and impaired wound healing in obese patients. Furthermore, the feasibility of surgery for all obese patients will be hampered by a limited degree of access in several centres. The EndoBarrier® is an intestinal 'bypass sleeve' made from an impermeable polymer that is endoscopically inserted into the first part of the duodenum. The sleeve promotes weight loss by partially impairing nutrient absorption, but more interesting is its ability to improve diabetes control prior to weight loss. This suggests that its crucial beneficial effect is through the modification of key gastrointestinal hormones involved with insulin sensitivity, satiety, and weight control (namely GLP-1). Further studies are currently underway to better define its efficacy and potential role in the management of obesity, and NAFLD. At their centre, the authors offer the insertion of IGBs for weight loss in obese patients, particularly those who have failed lifestyle and drug interventions, and who are invariably at higher risk of adverse outcomes from untreated disease over the long term. This service is provided in conjunction with holistic dietetics support, with the intention of providing each patient with the tools to continue lifestyle change, and hopefully maintain weight loss following IGB removal. Although disease recognition has improved over the past few years, further work is required. Given the magnitude of the problem, a holistic, multidisciplinary, and individualised approach to disease management will be the key to achieving any realistic change. This will undoubtedly involve greater recognition of the problem at parliamentary level to enable broader education, and nationwide strategies aimed at the promotion of more widespread preventative measures. There is an important role for primary care physicians, not only in the opportunistic screening and identification of people who are at risk, but also in the provision of essential education and preventive advice where possible. Although referral for specialist care is important, overly-stretched, limited hospital resources mean that reliable preliminary staging needs to be undertaken in the primary care setting. We advise the use of the algorithm shown in Figure 1 (above) for triaging patients with suspected NAFLD/NASH. Where patients manifest any risk factors for more advanced disease, such as persistently abnormal liver function tests, an elevation or progression of fibrosis score (using a validated fibrosis scoring system), or concerning changes on liver imaging, it is suggested that referral to a specialist unit be made. Low-risk patients without risk for disease progression or complications, should be managed through supervised dietary and physical activity programmes, with regular monitoring of anthropometric and biochemical indices, and management of associated features of the metabolic syndrome (e.g. screening for diabetes, hypertension, dyslipidaemia), with further referral for specialist care as appropriate. In the secondary care setting, further staging is usually undertaken (e.g. with transient elastography or liver biopsy), and ideally a multidisciplinary approach to disease management is provided (including the regular involvement of dietitians, exercise physiologists, and psychologists). Referral for centre-specific treatments—such as bariatric endoscopic devices and bariatric surgery—should also be considered whenever available, including access to novel therapies in a clinical research setting. It is projected that NAFLD will become the principal cause of liver transplantation among affluent and emerging economies. Non-alcoholic fatty liver disease encompasses a spectrum of liver disease that is inextricably part of a more complex, systemic disease process, often linked with deeply entrenched maladaptive behaviours. Lifestyle interventions remain the mainstay of treatment, but several new pharmacological agents and endoscopic devices may provide additional therapeutic options. A holistic, multidisciplinary, and individualised approach will be the key to effective disease management, with a pivotal role for primary care in opportunistic screening and triage, provision of preliminary management and monitoring, and ensuring ongoing education and preventive measures. Primary care physicians have an important role in screening and triaging for suspected cases of NAFLD/NASH. Uncomplicated cases should continue to be managed and monitored in the community, while people with more advanced disease, or those whose disease is at risk of progressing, should be referred for secondary evaluation and specialised treatment where appropriate. Lifestyle modification remains the key intervention for treating NAFLD, and can be implemented in primary care; however, pharmacotherapy (using drugs that are often outside their marketing authorisation) is probably best reserved for specialist care, or under shared-care agreements.